Be prepared for spills in your lab. 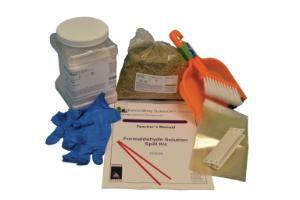 This kit includes a dust pan and brush to properly dispose of spills. It also includes vinyl exam gloves, so you are protected while cleaning. Ordering information: This kit includes an instruction sheet/SDS, vinyl exam gloves, polybags, twist ties, blank shipping tags, dust pan and brush, vermiculite, and an absorbent formaldehyde neutralizing agent (sodium bisulfite).